For the first time since November, the Grinder is up and running. Feels pretty good, donnit? Listen to the eponymous song from the 300 soundtrack at right on repeat as you read this. MLS suddenly takes on an Odyssean quality, I find. If you'll remember, the Grinder trudged off into its cave for winter hibernation after watching Donovan and Becks engage in a bro-hug for the ages. Now that our league is back and rapidly growing up before our eyes (our little boy is 17 now! ), we have even more things to digest, mull and scream bloody murder/joyously about. What a wonder. As a brief aside, I purchased MLS Live for this season as an early birthday gift for myself. It is a marvelous piece of technology. Every MLS game all year on my laptop... in HD? Kill me now, bro. I'm in heaven already. My girlfriend is going to haaaaate me. You remember the drill. Let's get to it. Now in ColecoVision. We'll get to the game in a minute. This being the maiden voyage of NBC's much ballyhooed coverage cycle, let's spend a few words on what's in store for MLS' 17th year and first with a big boy TV contract. My main gripe about FSC's in-game coverage, other than the ubiquitous spotty play-calling that plagues regional broadcasts in almost every US market, is the feed. I don't claim to be an expert on the inner-workings of television broadcasts, but the audio always seems remote and subdued, and the video, HD only in name, is flecked by pixelated granulation. The channel has made unquestionable strides, but it has always had the veneer of a bush league channel trying to be a big league one. In this sense, ESPN's weekly EPL broadcasts and work with the Nats, intermittent as they are, lapped FSC in almost every arena. Which is why NBC's splash onto the scene is such a breath of fresh air. If Sunday's two and a half hour introductory piece for US soccer fans is any indication, we'll get the consistency of FSC with the production value of ESPN. There were a few hiccups, but for a first broadcast I can have few big complaints. Arlo White was solid as always, though he occasionally falls into the American trap of the motor mouth, feeling the need to fill every small moment with words. Most were interesting. Some were useless. I'm trying hard to like Kyle Martino's broadcast persona, but this is a hard sell for me. Maybe he'll come around. But beggars, as we all are in this department in the US, cannot be choosers, and relatively speaking it seems as though this will be a bearable partnership at worst. White continually came back to a word that appropriately sums up New York's effort on Sunday: ponderous. Surprising that a team this top-heavy with attacking talent can be so terribly stodgy going forward, but then I think we always seem to underrate Luke Rodgers on account of his not being Juan Agudelo, who kind of just vindicated Backe's many snubs last year. The scoreline was a slight illusion. New York was railroaded even without having had to face David Ferreira, who is nursing a sore achilles. Kevin Hartman had little to do until Kenny Cooper subbed on late and surprisingly looked worlds better than either Agudelo or Thierry Henry in the finishing department. The final 10 minutes were a positive stretch for New York, but where was this earlier? Agudelo's name required few mentions from White. Henry, as is his wont, dropped back into shallow midfield once New York fell behind with the intent of facilitating. It went reasonably well but robbed NY of many real options in the box for his crosses and through touches. Cooper's inclusion remedied that issue, but it was too late by then. FCD's unsung hero on the day was Andrew Jacobson, the real connective tissue in the center between Daniel Hernandez, who organized the back four, and the advanced midfield line headlined by Ricardo Villar, who ripped a page from Messi's book for FCD's second goal in the 61st minute for a 2-0 lead. New York's kryptonite is set pieces, and it does opponents well to stick a finger in that wound and apply pressure until the Red Bulls tap out. Dallas, it appears, got the memo. Jacobson's excellent in-swinging cross, the second phase after a first failed clearance, led to Zach Loyd's opener in the 11th minute. This will be a continuing theme to watch as New York attempts to forget all about this one. FCD, on the other hand, joined RSL as the weekend's big winners. - Just mentioned RSL, so I've got to give a shout to the Royal Mormons, who pulled off the shock of the weekend by eliminating all of LA's juice in a 3-1 thrashing. The game's scoreline won't reveal that it was dull and cynically played for most of the opening hour, and it seemed for a time that we were quietly headed for a scoreless draw that would tell us nothing about either side. Edson Buddle snapped down another David Beckham cross that brought a tear to our eye and reminded us all how much we love sunsets and power tools (in that order), and we all thought that 2011 LA, the one that stomped on its foes lovingly after getting them down, was emerging here. But the slick grass at HDC created a Sean Franklin own goal, and LA's back line utterly collapsed in the final 15 minutes. This is something to watch very carefully. Bruce did not go with Juninho in the starting XI, leaving the center back pairing of AJ DeLaGarza and rookie Tommy Meyer to fend for itself. Marcelo Sarvas dropped deep, increasingly so as the game wore on, to try and shield a pairing that was clearly uncomfortable together, but once in the box RSL was irrepressible. I'd like to chalk this up entirely to RSL's tempestuous, overflowing attack, but I don't think you can. RSL is a very good team going forward that LA made look unstoppable in the final minutes. We'll see how deeply the ramifications of this one go. Or how much a Leonardo return even helps. As far as team anthems go, well... RSL spanks everybody. - I watched most of the DC-KC matchup and, for the most part, was slightly disappointed and mostly bored. I'm unashamed to say I fell asleep in the second half. Slow starts off the blocks aren't unheard of for most teams, even ones with designs of winning things as both of these teams do. So it's not like there are alarm bells chiming here. But for my own aesthetic pleasure, too many speculative long balls, not enough movement on the floor. And I wasn't crazy about Ben Olsen's decision to stick DeRo up top. But this is the best of the best, so CJ Sapong is rescuing us with an inglorious stoppage time winner that has KC already above its form from the first several months of 2011. Go figure. - Urgent message from the MLS redundancy department: Chris Wondolowski scored again, is talented. - Goal of the opening weekend goes to Colorado's Quincy Amarikwa for doubling the Rapids' lead on a completely underwhelming Columbus side. Thor's Hammer. - I get the feeling that it'll be a long season in Montreal. I know it's early, and I know Vancouver is improved offensively, but what I saw from the Impact was well behind even where I'd thought they'd be at this stage. I expect Matteo Ferrari to fight through an adjustment phase, but even 12-year-old defenders know not to phase yourself out of the play like he did on Camilo's goal to put the game well out of reach in the second half. And the attack was toothless except for a few fleeting moments. I know better than to throw in the towel based on a single game, but the Impact are going to need to bring it much, much harder if they hope to avoid Vancouver's freakishly bad expansion lead from 2011. 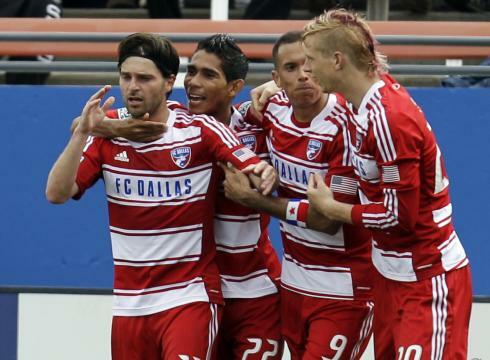 - FCD needed five - count 'em - five stoppages in play today for injuries. Among them were hero Ricardo Villar, Brek Shea and Fabian Castillo, who couldn't continue after sustaining a deep knee knock. Now there's talk of Castillo missing the Portland fixture on Saturday with possible ligament damage, which would heap onto Shea's possible absence for the upcoming Olympic qualifiers. Add that to the fact that David Ferreira is still out, and FCD fulfilled the almost impossible task of having an out-of-action sheet that looks like August... in March. Oof. But Castillo looked absolutely terrifying in spurts, so whenever he does come back... watch the hell out. Hey, no draws! Let's see how long that lasts. Martino and Dunseth both aggravate me in the same way. Both guys typically have fantastic things to say (Dunny moreso), but they talk in circles when they would be much better served simplifying. I'm not crazy about this new penchant Martino has for putting oddly weighted emphasis on certain words because it seems like "that's what commentators do." He does it almost every third word now, it seems. He's much brighter than, say, Twellman, but he tries too hard. marvell wynne, the hungry beast is ready for feeding and first on the plate. dilly duka, better luck next time rutgers. Yeah, I don't know what to think with DC. I don't know if I should be encouraged that they held on so long with so little cohesion, or if this is a sign that some pieces just don't fit. It's early, but somehow, we need to figure out how to make Bosko effective in this league, and get De Ro back on form (he's got a groin strain problem). It helps that SKC and Houston are (not surprisingly) the strongest squads in the East, and the rest is manageable. I was at the DC/KC game and it was painfully stagnant. Pontius is incredibly useful, but not on top of the diamond. The whole midfield setup really made little sense to me. Bosko was (supposed) to be the top of the diamond. De Ro was supposed to be a withdrawn forward. Neither of them are in any kind of form right now, so maybe that dynamic will improve. But the chemistry between our big money players was the biggest problem on the night. to me, dcu's biggest problems where the finishing and giving up a late goal. these new players and ones coming back from injury have not meshed yet. dc looked strong on challenges and really had pertty good control of the game. credit to skc, they are a strong team and sapong was playing with that little extra emotion, and fresh legs. Good post, glad that the Grinder is back. Watching NBC's broadcast, I was thinking to myself "I really like Sounders Arlo White much more than the NBC one." And the constant hairstyle references to Shea were psotively Dave O'Brienesque. If NBC lets the game breathe a little more, we'll all be happier with the end product. Love Robbie Earle. When you hear his voice, you know it's a big match and he never disappoints with his comments. Gets in and out with not too much fuss. To me, he would be better in the sideline analyst role with Martino being moved to the studio. Add Steve Davis to the halftime show and now you really have something good. Gotta bring it old school sometimes. I know Matthew Doyle just waxed poetic about the diamond midfield over on MLSsoccer.com - and I do think it's under-utilized - but I don't think it's right for everybody. I understand Olsen's thinking with scooting DeRo further toward goal, but I don't necessarily agree with it. I'd like to think the formation will eventually more closely resemble a 4-2-3-1 out of the gate with United having no qualms about DeRo playing the #10 rather than even messing with calling him a striker at all. Knowing DeRo, he'll inject himself into the game quicker if he's worrying less about getting goals but rather just letting the game come to him. That's when the insanity usually happens. NY should take a look at how Jacobsen links play with Hernandez sitting deeper. That's the way that Dax and Tanio should interact with Dax moving forward into space. Those two don't seem to work very well together and it creates a void in NY's midfield. I think Hans agrees with you, Phil. He recognized how ineffective that flat back combination was in the first half, with Dax and Tainio sitting back on a shelf without adding anything to the attack. So he organized them vertically in the second half with much more success, Dax going forward to essentially play next to Henry and Tainio marshaling the defense. As you saw, New York was much better over the final 45. Good grinder, great to have it back. But I'm surprised about the reaction to Martino, although your comments seemed to be more about the style of the the delivery than what he's delivering. Personally, I like him. His comments are very tactical, usually breaking down how a play developed. Frankly, I think he's the ideal analyst. I'm a big Arlo Smith fan, but he was too talkative yesterday. i feel like he'll dial it down a bit as the season goes on. How many times did he have to say "they're screaming for the ball" in the last ten minutes of the game? I was having brain aneurysms, actual brain aneurysms. What Martino says isn't my deal. It's the package he wraps it up with. I think he's a smart guy who's still finding his niche in broadcasting. Nothing particularly wrong with that, and I'd assume it takes time with everybody. He hasn't been doing it that long. Jay, way to comment hurt, bud. @UnitedDemon Looked to me like Bosko was hanging left with Pontius through the middle. Either way, it didn't work. DeRo reminds me of Dempsey in the sense that you can play him up top and he could very well bag a goal or two, but he'll have more influence from midfield. @dikranovich Speed of thought. They were in good positions plenty, just didn't know when to pull the trigger or hit a damn cross ex. Najar trying to cross his man umpteen times in the corner when he could have hit it first touch. dc united almost grabbed caleb porter a couple years ago. he turned the job done and must have known that the u/23 gig was maybe on the horizon. it works out well for US coaches, because olsen gets to cut his teeth also. coach porter is a winner and so is coach benny. dc was attacking down the left more with woolard, than robbie russell was doing down the right, thats why pontius was moving a little central i think deleon might end up playing left back, if he is ever healthy. there are many good looking teams in MLS thus far, and how about that portland crowd. good crowd, decent soccer, lousy weather, invisible freddy. anybody have any info about the number of foreign players in the dutch league, who also have international experience? in MLS i think it is about 10%, thats ten percent of the foreign players in MLS have caps with their national team. i cant get this deuce own goal thing outta my head. why is it so flipping difficult to understand why this is an own goal? well, the funk dubious goal panel is going to meet pretty soon, at least in the next month or so. who be the doobie? this is about more than just an own goal also. jesus, the panel met to confirm 25 goals last time out and thats exactly what the panel did, they confirmed that three own goals were in fact own goals, and that 22 goals were scored by the proper player. ill be a god dang monkeys uncle if they reverse this decision. Dikranovich, just let it go already. No one cares to relive those debates.